Dennis O’Keefe, 56, had a leg amputed following an accident at Blackpool Pleasure Beach where he formerly worked and was fitted with a prosthetic leg. As a result he started to claim Disabled Living Allowance saying his ability to walk was extremely limited and he needed walking aids. 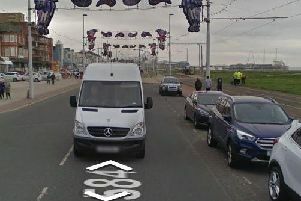 However, O’Keefe of Washington Avenue, Bispham, started his own security and investigations company and also worked as a security officer in the resort. District Judge Jane Goodwin sitting at Blackpool Magistrates Court heard O’Keefe plead guilty to fraud between 2013 and 2016 when he illegally claimed £14,288. She gave him a 12 week jail term suspended for a year, 30 days rehabilitation and ordered him to pay £235 costs. Repayments to the Department of Work and Pensions for the money he gained are being removed from legitimate benefits, the court heard. The judge was told O’Keefe had run up debts of £40,000 and knew it was wrong but continued to claim disabled living allowance even though was able to work. O’Keefe said he was scared of making a frank declaration of what he was doing because he did not want to lose his Mobility car.